Established in 2004, EaseUS always takes the responsibility for better serving great users to protect their data security as its destiny and never stops moving forward on the path of solving troublesome data cases over 180 countries and areas. 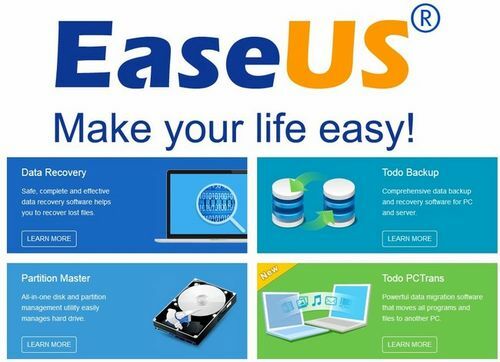 As an worldwide renowned professional software developer, EaseUS always takes the lead in solving users data troubles with data backup, data recovery and storage management solutions. What makes EaseUS unique is that we take the goal to make your life easy as our eternal mission so that we’ve produced multiple excellent software to solve data problems on PC, Mac, iOS & Android devices. Easily transfer data and applications to new PC/OS, perfectly optimize your Windows or Mac OS to make your PC run faster and perform better. Easily clone & copy partition or disk. Automatically sync files. Best tool to speed up your computer, make your OS error-free, clean up the junk files, remove unwanted software etc. For faster speed, for better Mac. Free up more disk space and keep your Mac healthy. Find and remove duplicate files, unwanted large files, useless Apps etc. Easily control your Mac machines. EaseUS Disk Copy Technician Edition is a potent software providing sector by sector disk/partition clone regardless of your operating system, file systems and partition scheme. The sector to sector method assures you a copy 100% identity to original. EaseUS Disk Copy can be used for copy, cloning, or upgrading your original small hard drive to a new larger drive. Simply speaking, it can copy anything from old hard drive including deleted, lost files and inaccessible data. So, the freeware is a perfect tool for Data Recovery Wizard to recover files from a backup disk. Professional file syncing software to automatically sync files between the computer, FTP, Google Drive, OneDrive (Skydrive), Dropbox, network share. Professional PC transfer software to transfer data & applications to new PC/OS. * A reliable & complete data/application transfer tool for Windows XP/7/8 upgrade to Windows 10. PC transfer software, allows unlimilted usage & provides service to clients. PC Transfer Solution for Unlimited Usage which allows unlimited usage within one company, and provides technical service to clients. It enables easy data and application transfer to new PC/OS.